The NEC DSX is the perfect telephone system for businesses that need between 4 and 80 phones and Teleco Business Telephone Systems is the perfect company to provide and install it for your business. Teleco has been in business since 1978. Teleco never uses sub contractors. All NEC DSX installations are done by our own in house, local factory certified technicians. Whether you need an NEC DSX 40, NEC DSX 80, or the largest NEC DSX 160, Teleco can provide installation and service though out New York and New Jersey. Don’t buy from some internet company across the country that will just ship you boxes. Buy from a local business that has been helping companies across New York and New Jersey for over 40 years. You can count on Teleco Business Telephone Systems when you need on site service and support. We’re local just like you. The NEC DSX represents the next generation of NEC telephone system and provides efficient, enhanced communications. The NEC DSX comes in 3 sizes to meet every need and budget. The NEC DSX-40 is perfect for the small business or residences with multiple lines, intercom, and door phone requirements. 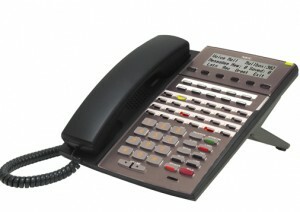 The NEC DSX-40 supports up to 8 outside lines, 24 digital telephones. The NEC DSX 40 also has 2 analog station ports and 2 door phone ports built right in. The NEC DSX 80 is ideal for small and medium sized business that need all the features and flexibility of an expensive telephone system, without the expensive price. The NEC DSX-80 can expand to 32 phones and 32 outside lines. The DSX-80 also supports T1 and PRI digital telephone lines. The DSX 80 can easily be upgraded to the next size up, the DSX 160 with 1 simply part. The NEC DSX 160 can support up to 96 phones and 64 outside lines. The DSX-160 also supports multiple T1 and PRI digital lines. All NEC DSX telephone systems also support SIP VoIP remote stations. 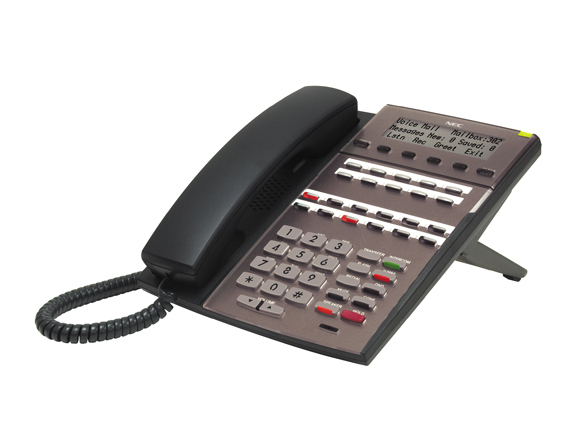 You can use standard SIP phones, SIP soft phones, and NEC’s own proprietary SIP multi-line feature telephones which give the same exact functionality as their digital multiline telephones. The DSX 40 supports up to 16 SIP phone and the DSX 80 and 160 support up to 32. All with a single VoIP circuit board that doesn’t affect system capacity at all! NEC designed the DSX hybrid key system from the ground up with affordability in mind. High-density circuitry maximizes economy per port. Native support for T1 and ISDN PRI provides maximum connectivity for a low initial investment. The NEC DSX system offers high performance, flexibility and the ability to custom design a system that meets your company’s specific telecommunication requirements today and well into the future. Over a decade of rigorous feature development ensures that the core DSX call processing features are mature, efficient and reliable — yet intuitive and easy to use. Combined with end-to-end quality assurance and state-of-the-art circuit design, the DSX will be your reliable business partner for years to come. Click here for an interactive demonstration. On-board flash memory, which provides a faster response time than PC hard drive memory and is not affected by power loss. Advanced Speakerphone capabilities. The NEC DSX processor is so advanced it makes standard speaker phones act line “virtual duplex” speaker phones. Software upgrades can be loaded easily without requiring changes to hardware. Built In Message On Hold Functionality with IntraMail Voice Mail. No external player needed! Innovation starts with the new ergonomically styled NEC DSX telephones. 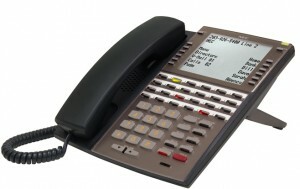 There are 3 models of DSX telephone, 22 button, 34 button, and 34 button full duplex speakerphone super display. There is also a 60 button attendant console. All DSX models feature the same thin, floating design with two-position angle adjustment for effortless viewing of the large LCD display, and built-in wall mount kit. All desk sets have built in headset jacks, so there is no need for separate headset amplifiers or handset lifters. Both 34 button models feature back lit displays and keypads. For remote applications, there are 2 VoIP key sets, a 34 button duplex speaker display and a 34 button duplex speaker large screen display telephone. 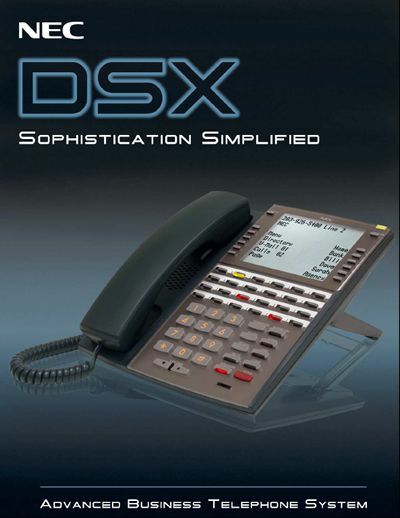 The NEC DSX also supports industry standard SIP phones including SIP soft phones such as X-10. The VoIP and SIP phones can work via VPN or even with NAT Transversal with certain routers. 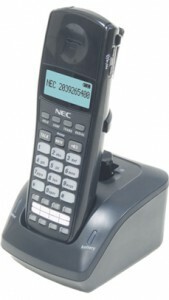 You can also use standard analog phones, fax machines, and credit card machine with the NEC DSX. There are 2 digital cordless telephones available. Both digital cordless phones provide enhanced features, multi-line operation, extended range and exceptional clarity. The Cordless II Lite is designed for most office applications. The Cordless II Lite is a 900 Mhz digital narrow band telephone and provides a range of up 350 feet, depending on site conditions It features 4 programmable buttons, up to 7 hours of talk time, a 2 line display, headset jack, and comes with a belt clip. The newest, most advanced cordless phone is the Cordless DECT. The Cordless DECT is a 1.9 Ghz phone that has a range of up to 984 feet (unobstructed, outdoors). The Cordless DECT phone is designed for large buildings and warehouses, multi-floor businesses, and out door facilities. The range can be extended with the use of DECT repeaters. DECT repeaters can provide complete call coverage thought out your building or property. The Cordless DECT has up to 16 hours of talk time, 8 flexible buttons, a 3 line display, headset jack, and comes with a belt clip. Plus you can use an analog cordless phones on the DSX to provide inexpensive cordless phones that require fewer features. Advanced features and intuitive soft keys provide users with one-button access to extensions, lines and system features. With many models to choose from, each user can enjoy customized service and performance. 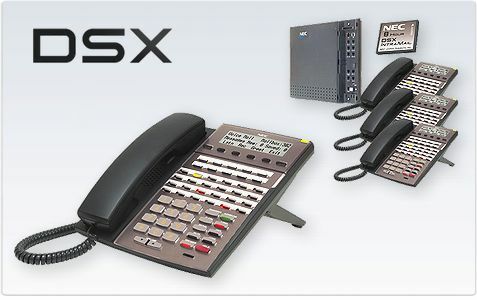 The NEC DSX features a family of telephones that sets the new standard in office communications. Innovations continue with the NEC DSX telephone system. Right out of the box, the NEC DSX has built-in Automated Attendant which answers incoming calls, plays a greeting, and allows callers to directly dial extensions and departments without operator assistance or additional equipment. Perfect for the small business that doesn’t want or need voice mail but could use a hand answering calls from time to time, the built in automated attendant fits the bill and the price couldn’t be better, it’s free! 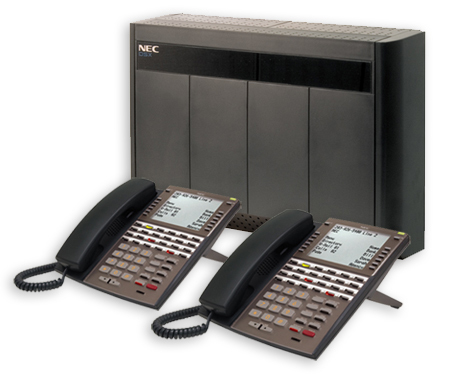 NEC’s legendary reliability and quality standards are even more evident with the fully integrated, flash-memory-based IntraMail voice mail systems. 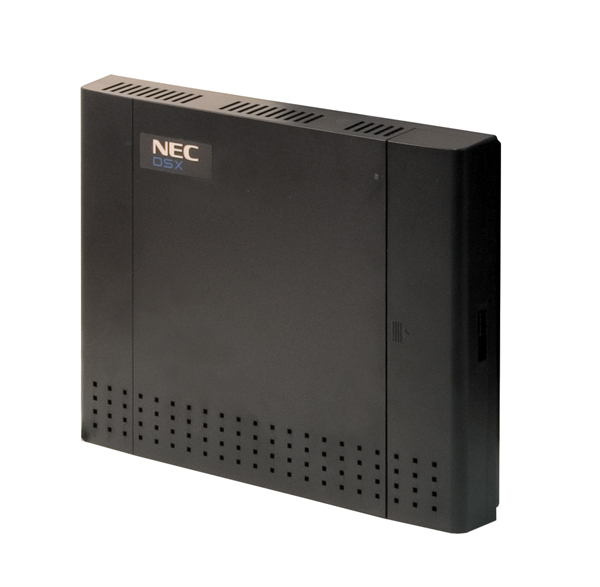 IntraMail is compatible with any DSX communication system from NEC. IntraMail is available in three different sizes for your voice mail needs: a 2-Port / Hour system, a 4-port/8-hour system, and an 8-port/16-hour system. For larger and more sophisticated installations, there is the IntraMail PRO. The IntraMail PRO comes in two sizes; There is a 4 port / 16 hour and an 8 port / 32 hour model. Besides the larger storage capacity, the IntraMail PRO provides Email Integration and multiple cell phone / pager number notification. The IntraMail only provides a single number for cell phone / pager notification. With version 3, the IntraMail can be upgraded remotely to the IntraMail PRO with a one time software license. This will give you the email notification and multiple cell phone / pager numbers if your business needs grow. You can also expand from the voice mail ports via one time remote software licenses. Additional ports come in 2 port increments, up to 8 port maximum. 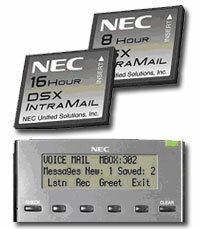 IntraMail builds on NEC’s base of experience with voice mail systems to offer a sophisticated yet easy-to-use feature set. IntraMail brings a new level of speed and simplicity to the features you’ve come to expect from NEC voice mail systems. IntraMail installs directly into the DSX system equipment for full integration. IntraMail does not require the optional expense of analog station ports for connection to the system, and it does not require a separate power supply. Full system integration allows IntraMail to supply interactive voice prompts to key system users. For example, when an extension user dials an intercom number not in use, a voice announcement plays to indicate that the number is not in service. In addition, with IntraMail the number of messages in your mail box will be shown when you enter your mailbox, plus a message waiting lamp on your phone will illuminate to indicate the presence of a new message. You can also send a broadcast message to all user mailboxes or to select users on a distribution list. A system announcement can also play automatically whenever a user logs into their mailbox to alert employees about important company announcements. Interactive soft keys on display telephones are another of the benefits of full integration offered by the IntraMail system. 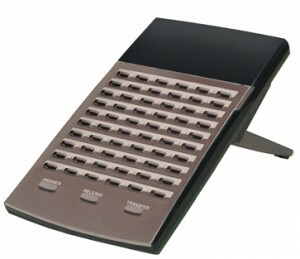 With the soft keys you are able to manage your voice mail without having to remember dialing codes. For example, to exit your mailbox after you’ve listened to your messages, simply press the soft key labeled “EXIT”. Busy offices are able to enhance productivity with IntraMail features such as Caller ID with Return Call. With your company’s subscription to Caller ID services from your local telephone provider, IntraMail can automatically capture the calling party’s phone number and associate it with the caller’s voice mail message. Caller ID with Return Call then makes it easier for your employees to return these calls. You can even return a call while listening to a message without even knowing the phone number. Fax detection can help you save even more money. Now there’s no need for a separate phone line for your fax machine. IntraMail can listen for a fax tone on an incoming call and automatically transfer these calls to the fax machine’s extension. If you’ve ever had calls during which you couldn’t take notes fast enough, or had the necessity to record important information so it can be reviewed later, the IntraMail has the solution for you. Conversation Record lets you record a conversation into your mailbox, review that conversation later, and then forward it to another extension. IntraMail also provides a special message on hold mailbox that can play music or a message to callers while they are on hold, at no extra charge. These are just a few of the many ways the IntraMail voice mail system, combined with the DSX communication systems from NEC, can help you save time and money.